O God, who renew the world through mysteries beyond all telling, grant, we pray, that your Church may be guided by your eternal design. Through our Lord Jesus Christ, your Son, who lives and reigns with you in the unity of the Holy Spirit, one God, for ever and ever. According to the 1962 Missal of St. John XXIII the Extraordinary Form of the Roman Rite, today is the feast of Pope St. Gregory the Great. His feast in the Ordinary Form of the Roman Rite is celebrated on September 3. Luigi Giovanni Orione, F.D.P., was an Italian priest who was active in answering the social needs of his nation as it faced the social upheavals of the late 19th century. To this end, he founded a religious institute of men. He was canonized by St. John Paul II on May 16, 2004. History, in fact, is not alone in the hands of dark powers, chance or human choices. Over the unleashing of evil energies, the vehement irruption of Satan, and the emergence of so many scourges and evils, the Lord rises, supreme arbiter of historical events. He leads history wisely towards the dawn of the new heavens and the new earth, sung in the final part of the book under the image of the new Jerusalem (cf. Revelation 21-22). It must be reaffirmed, therefore, that God is not indifferent to human events, but penetrates them realizing his "ways," namely his plans and his efficacious "deeds." According to our hymn, this divine intervention has a very specific purpose: to be a sign that invites all the peoples of the earth to conversion. Nations must learn to "read" in history a message of God. Humanity's history is not confused and without meaning, nor is it given over, without appeal, to the malfeasance of the arrogant and perverse. There is the possibility to recognize divine action hidden in it. In the pastoral constitution "Gaudium et Spes," Vatican Council II also invites the believer to scrutinize, in the light of the Gospel, the signs of the times to see in them the manifestation of the very action of God (cf. n. 4 and 11). This attitude of faith leads man to recognize the power of God operating in history, and thus to open himself to fear of the name of the Lord. In biblical language, in fact, this "fear" does not coincide with dread, but is the recognition of the mystery of the divine transcendence. Because of this, it is the basis of faith and is joined with love: "the Lord your God requires of you, but to fear the Lord your God, to walk in all his ways, to love him, to serve the Lord your God with all your heart and with all your soul" (cf. Deuteronomy 10:12). Following this line, in our brief hymn, taken from Revelation, fear and glorification of God are united: "Who will not fear you, Lord, or glorify your name" (15:4)? Thanks to fear of the Lord there is no fear of the evil that rages in history and one takes up again with vigor the journey of life, as the prophet Isaiah declared: "Strengthen the hands that are feeble, make firm the knees that are weak, say to those whose hearts are frightened: ‘Be strong, fear not!’" (Isaiah 35: 3-4). Your children may want to spend their afternoon learning about different local charitable organizations or needy families to whom the alms from the family's Lenten Jar will be given. Around the young Founder there grew up seminarians and priests who made up the first core group of the Little Work of Divine Providence. In 1899, he founded the branch of the Hermits of Divine Providence. The Bishop of Tortona, Mgr Igino Bandi, by a Decree of 21 March 1903, issued the canonical approval of the Sons of Divine Providence (priests, lay brothers and hermits) - the male congregation of the Little Work of Divine Providence. It aims to "co-operate to bring the little ones, the poor and the people to the Church and to the Pope, by means of the works of charity," and professes a fourth vow of special "faithfulness to the Pope." In the first Constitutions of 1904, among the aims of the new Congregation, there appears that of working to "achieve the union of the separated Churches." For lay people he set up the associations of the "Ladies of Divine Providence," the "Former Pupils," and the "Friends." More recently, the Don Orione Secular Institute and the Don Orione Lay People's Movement have come into being. Following the First World War (1914-1918), the number of schools, boarding houses, agricultural schools, charitable and welfare works increased. Among his most enterprising and original works, he set up the "Little Cottolengos," for the care of the suffering and abandoned, which were usually built in the outskirts of large cities to act as "new pulpits" from which to speak of Christ and of the Church - "true beacons of faith and of civilisation." He enjoyed the personal respect of the Popes and the Holy See's Authorities, who entrusted him with confidential tasks of sorting out problems and healing wounds both inside the Church as well as in the relations with society. He was a preacher, a confessor and a tireless organiser of pilgrimages, missions, processions, live cribs and other popular manifestations and celebrations of the faith. He loved Our Lady deeply and fostered devotion to her by every means possible and, through the manual labour of his seminarians, built the shrines of Our Lady of Safe Keeping in Tortona and Our Lady of Caravaggio at Fumo. In the winter of 1940, with the intention of easing the heart and lung complaints that were troubling him, he went to the Sanremo house, even though, as he said, "it is not among the palm trees that I would like to die, but among the poor who are Jesus Christ." 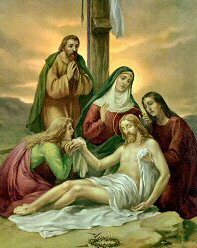 Only three days later, on 12 March 1940, surrounded by the love of his confreres, Don Orione died, while sighing "Jesus, Jesus! I am going." Learn more about the Sons of Divine Providence the order founded in Italy in 1893 by St. Luigi Orione. Today's stational church is St. Anastasia in Rome, where, formerly, the Mass of the Aurora on Christmas Day was celebrated. The first church was built in the late 3rd or early 4th century, and was one of the first parish churches of ancient Rome. It was given by a woman called Anastasia and called titulus Anastasiae after her. Later, it was dedicated to a martyr of the same name.